Germany - When we think of tragic love stories, Romeo and Juliet comes instantly to mind, together with the feud between the two families, the Montagues and the Capulets. The story has been rewritten several times over the centuries, always in new ways. This time William Shakespeare's play returns to the stage in the form of a touring rock ballet that starts out in Hamburg and stops over throughout Germany. This rewrite is the fruit of the creative minds of Rasta Thomas and Adrienne Canterna, the duo behind the international "Rock the Ballet" show. The lighting was designed by Patrick Woodroffe and Roland Greil from Woodroffe Basset Design, who chose, amongst other equipment, 16 Sharpy Washes made by Clay Paky, and a grandMA2 light and Network Processing Unit (NPU) made by MA Lighting. "Clay Paky Sharpy Washes are unrivalled thanks to their compact size. This is why they are always our first choice," Roland Greil said. 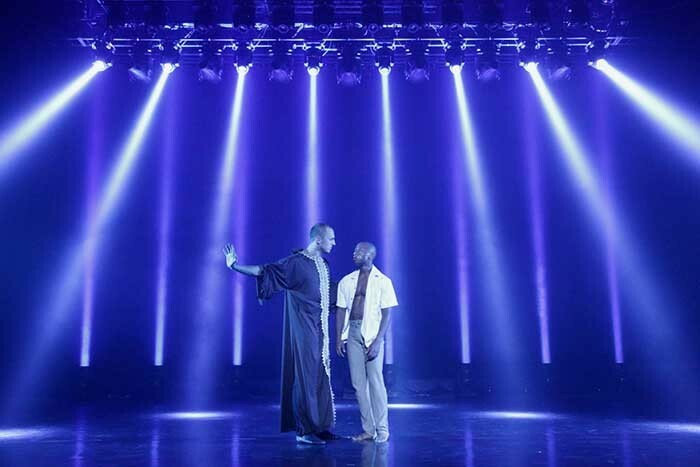 Regarding the lighting design: "Patrick and I had to create the most flexible possible lighting design with some oblique lights by combining moving lights and beam shapers. We also opted for a symmetric rig consisting of washlights, crowd blinders and beam lights, to give a flexible, classical and theatrical look, as well as a considerable lighting impact to accompany the modern music scenes. We also used the lights to create a stage architecture, since there was no set. The most exciting thing was giving life to a dull stage with proscenium and finding the right space for each setting. To achieve this, it was very important to reach the right combined balance between lights, video and look." Michael Kühbandner was in charge of the programming. Director and choreographer, Adrienne Canterna and consultant/stage manager Toby Gough. The show was produced by Collien Theater & Konzert GmbH. Showconcept provided the lighting equipment.